FACT: Insurance companies require no certification, qualifications, nor experience from those that perform "repairs"! The common term "rock chip".... is just that. A blemish. Cosmetic. The term isn't even used by real glass repair tehnicians. In true windshield repair (adhering to A.N.S.I. 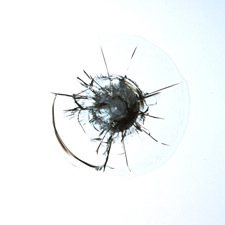 and NWRA standards), a "rock chip is a non-repairable item. Not UNrepairable. NONrepairable. Not a threat. Cosmetic. Sure, anyone can put a filler in that "nick" on your glass. (even though your windshield will get a few dozen more in any kind of highway driving) . The parking lot scammers want you to believe that the pin-sized nick on your windshield will, one day, run. Not true. But since it' s "free" to you, while charging your insurance company 79 dollars - yes, it IS a claim (3 strikes and you're out)... many fall for the scam. I spend a large portion of my day doing "re-works" on rock break "repairs" that have been attempted by amateurs. 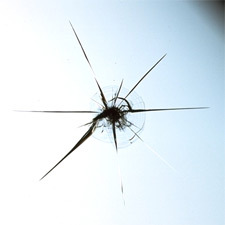 Consider this... if the thrust of their business is to sell and install auto glass, why would they want to invest the time into saving a windshield? Instead, be prepared to hear, "it's too big", "too close to the edge", "in the wiper path", or "in the tinted area", etc. If they do "repair" it........ generally, you will be offered a "rebate" on a new windshield if their repair "doesn't take." (their words)...... They gain either way! My business is saving windshields. It's how I put groceries on the table and pay my bills. This tested and approved system of repair permanently stops crack extension and restores the windshield. Allow me to demonstrate my 25 years of experience! So, how do you know if it's broken? You'll see black. Viewing the impact point from different angles will display black in the form of fractures (legs), or shading in a crescent-moon shape. Still not sure? In 25 years, I've never charged a fee to look and discern what action (if any), is needed. Where on the windshield can you NOT repair? I've heard 'em all.... "not within 4 inches from the edge", "not in the driver's view", "not within the wiper path", "not in the tinted area", ..... THE TRUTH IS.... ANYWHERE. If you can cover the damage with a silver dollar, it is repairable and warranteed. In the case of running fractures, (often appearing from a border) a length of 12 inches is often manageable providing that the break is recent. ( one week is starting to get old). Incidently, the chief culprit of a running fracture from top or bottom is the metal roof or hood in direct sun getting HOT. Shade is your friend! as little as 43 bucks spent now.... saves hundreds in replacement later! SMALL BREAKS QUICKLY BECOME LARGE CRACKS !